Blessed with abundant oil reserves, Venezuela was once South America’s richest country. Now, it is a shell of a nation, facing the worst humanitarian crisis in the Western hemisphere. More than 3 million people have fled the country, escaping rising violence, food shortages, political persecution, and a crippling 1,370,000 percent inflation that makes any amount of money people may have worthless. Things are so dire that, according to a report from the Organization of American States, newborns have a better chance of survival in Syria than they do in Venezuela. Still, humanitarian aid has become a political affair. On one side, the anti-democratic President Nicolás Maduro has shut down the country’s borders to avoid aid from reaching his country. He denies that his fellow citizens are facing food shortages. Mr. Maduro claims that humanitarian aid operations are, in fact, a Trojan horse from Uncle Sam to undermine his administration and oust him from power. 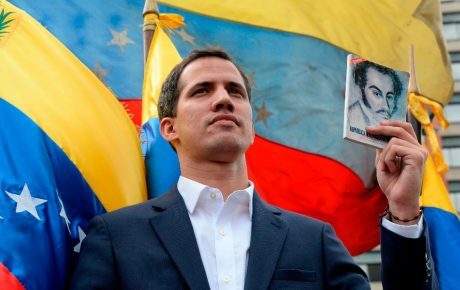 In his eyes, the operation would facilitate a transition to hand the country’s reins to Juan Guaidó, the opposition leader who declared himself interim president—and has been recognized as such by over 50 countries. In all fairness, Mr. Maduro is not wrong about that. The world’s most recognized humanitarian aid organizations, such as the International Red Cross and UN agencies, have stayed on the sidelines. They follow a principle of neutrality, and cannot act when aid is being used for political purposes. “We are open to taking humanitarian aid to those in need, but they must be favorable with our actions,” said Sandra Lefcovich, spokeswoman for the Red Cross regional office in South America. 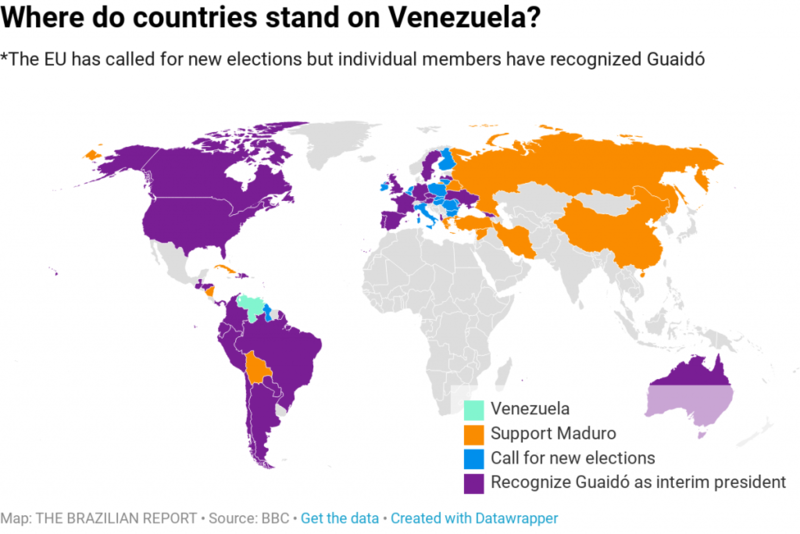 On the other side, the U.S., Brazil, and Colombia claim that Mr. Maduro’s regime has descended into dictatorship, and that his government is incapable of offering citizens the most basic living conditions. Humanitarian aid may represent salvation for thousands, millions of people. Over 13,000 doctors have left Venezuela since 2015—and the country faces a shortage of around 85 percent of all medicines. Meanwhile, violence is spiking at appalling levels: in 2017, the country recorded 73 violent deaths every day. Since Thursday, the Venezuelan government has shut down its borders with Brazil and Colombia, precisely where the humanitarian aid—with food supplies, medicines, and basic hygiene products—are expected to arrive today. And tensions have quickly escalated. On Friday, a group of the Pemon indigenous tribe had a confrontation with security forces in the small town of San Francisco de Yuruani, by the Brazil-Venezuela border. They were protesting the military convoys sent to block the border, and were shot at. Two people were killed, and 15 others were hurt (some of which were taken to the Brazilian side for treatment). Tensions between the Maduro administration and the Pemon has risen since February 10, when the group announced it would let humanitarian aid convoys cross their land—going frontally against the government. This indigenous group has self-proclaimed itself the “legitimate authorities” in Canaima—a southeastern region sharing a border with the Brazilian state of Roraima. Where will humanitarian aid go? The U.S.-Brazil-Colombia operation is set to send humanitarian aid through two points: Cúcuta, in Colombia, and Pacaraima, in Brazil. The presidents of Chile, Colombia, and Paraguay flew to Cúcuta, where Latino pop stars gave a pro-Juan Guaidó concert arranged by British magnate Richard Branson, who believes that “music can save Venezuela.” The move by neighbor presidents is a clear act of hostility towards the Maduro administration and could further escalate tensions. 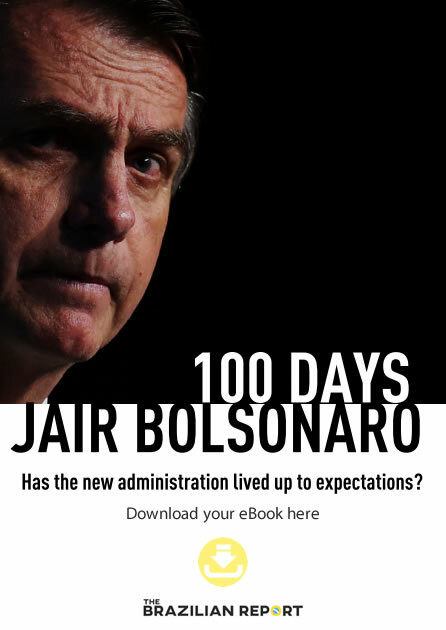 In the Brazilian side, President Jair Bolsonaro called an emergency meeting on Friday evening, with his military cabinet and the heads of all branches of government. 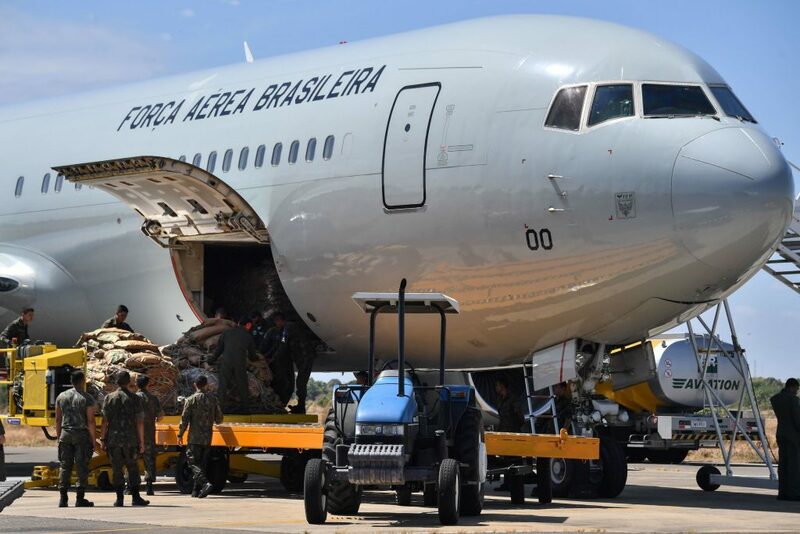 Military officers and House Speaker Rodrigo Maia were against continuing with Brazil’s role in the crisis, pulling the plug on the humanitarian aid operation. But the other participants, with whom the president sided, voted in favor of keeping the country’s stance. In Pacaraima and Boa Vista, Brazil has stockpiled 22.8 tons of powdered milk and 500 first-aid kits. To Cúcuta, the U.S. has sent 191 tons of medicine and food that could supply for 40,000 people for 90 days. 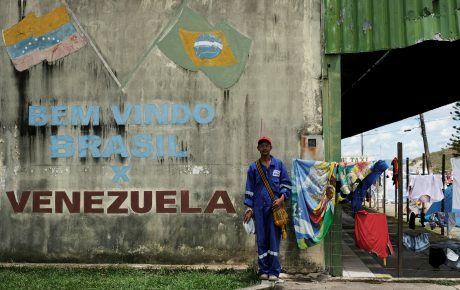 Brazilian authorities have claimed that the aid products will remain on the Brazilian side of the border—and Venezuelan drivers must take them and re-enter their country, where they will surely be met with violence and threats from security forces. It’s a lose-lose scenario for them. 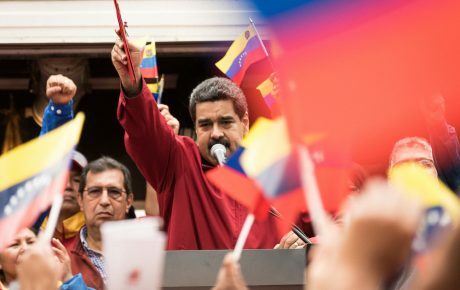 Things could get even worse after the Foreign Ministries of China and Russia —both countries support Nicolás Maduro— stated that the forced entry of humanitarian aid in Venezuela could spark conflict. “China is against any military intervention in Venezuela, and any action could escalate conflicts in the country,” said Geng Shuang, a spokesperson for Beijing. It seems hard to believe that Mr. Maduro will be able to cling on to power for much longer, as his country crumbles quickly. 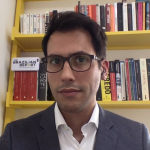 But the world’s powers don’t seem to be preoccupied about the living situations of Venezuelan citizens, rather eyeing the profitable contracts which will be needed to rebuild the country from the ground up.